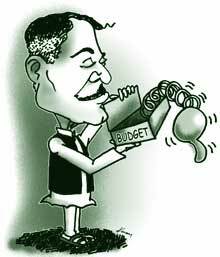 As always , in the run up to Budget 2002-2003, there was much speculation about what the budget would or would not contain, and what finance minister Yashwant Sinha might or might not say in his speech. February 28 has come and gone, and the speculation is over. Budget pundits are now busy dissecting the budget for the benefit of the few that are not engrossed in cricket, politics, religion or the gruesome carnage in Gujarat. "101. Honourable members, I now turn to an important issue, namely, that of environmental degradation. As this august House is well aware, the severity and magnitude of environmental problems in our country has brought us to a point where the cost of environmental degradation every year is almost as large as the rate of growth of the economy. In other words, environmental problems threaten the very sustainability of our economic development. It is imperative that we move beyond tokenism and tinkering with the tax code to a paradigm shift in tackling our environmental problems -- lip service to the environment will not suffice. 102. I, therefore, recommend wide ranging measures for sustainable development in this budget. These are aimed at removing policy distortions, and addressing market failures that give rise to environmental problems. 103. To address the widespread problem of water pollution, I propose an increase in the rates of water cess and a fundamental change in the manner in which it is levied. In line with the recommendations of the Ministry of Environment's task force on market-based instruments in 1997, I propose that the cess be levied not on water consumed but on the pollution load, such as the amount of biological oxygen demand (bod) generated by a firm. Further details will be announced by my colleague, the minister for environment and forests. 104. For local air pollutants, such as sulphur dioxide (so 2) and oxides of nitrogen (nox), we have made an allocation of Rs 50 crore to launch a pilot emissions trading scheme. This scheme will be implemented by the environment ministry, and firms will be allowed to buy and sell permits subject to an overall ceiling. It is high time we moved beyond the bankruptcy of the inspector raj to approaches that have been tried with great success around the world. Therefore, I propose these measures in the budget. 105. Similarly, for new vehicles, I propose to levy an environmental excise duty (eed) linked to the emissions performance of the vehicle. This will create an incentive for vehicle manufacturers to reduce emissions even below Euro ii or Euro iii standards. Doing so would reduce the amount of eed they need to pay. At present, there is no incentive for them to go below Euro standards. I also hope that state governments will couple this with higher vehicle registration fees, and parking and congestion charges to reflect the true social cost of vehicle ownership and use. 106. More generally, I firmly believe it is through economic instruments, such as pollution charges, tradeable permits and deposit refund schemes, backed by a strong monitoring and enforcement regime, that we will be able to tackle the growing menace of water and air pollution and other environmental problems. In addition, these instruments are attractive since they generate revenue. They are now being applied in a number of countries, including China, Malaysia and Singapore. By moving ahead decisively on these, we can show ' hum kisi se kam nahin '. 107. I am also convinced that there is an intimate link between natural resource degradation and poverty, with both feeding off each other. Unfortunately, this two-way causality has been neglected in the past. This has resulted in a failure to recognise the potential of improved natural resource management as a policy tool in the alleviation of rural poverty. My government is committed to investing significant resources in natural resource regeneration as a means of combating rural poverty. We realise that true security for our citizens is not measured by the number of tanks andwarplanes but through safeguarding and enhancingthe biomass base on which so many of my fellow Indians depend.Henceforth, we shall halt and reverse the dangerous drift towards militarisation, and focus on ecological security as the meaningful way to think of security. 108. To this end, we have taken a historic decision to freeze our defence spending, and use our resources towards a massive nationwide programme of watershed management, rainwater harvesting and reforestation that will involve local communities. We realise that the 'guns and guards' approach to forest management is not sustainable in the long run, and that local communities have a stake in managing these forests. Thus, companies that source wood from community forests will receive tax concessions. This will increase demand, and provide communities with an incentive to plant trees and create jobs. 109. Members of this august House are well aware of the precarious condition of central and state government finances. At both levels, the revenue and fiscal deficit are ballooning. We cannot continue to live beyond our means, and mortgage our future. Interest payment on past debt is eating away a major chunk of our revenue. The state of Kerala has embarked on a bold and long overdue programme to downsize the holy cow of state government. We at the centre must follow suit. Note: All figures in Rs crore. * Babu cost has been arrived at in this manner: The budget documents contain details of the number of employees in each ministry and the total outlay on pay, allowances (other than travel) and travel expenses. The three figures are added up to arrive at the babu cost. 110. This is particularly true in the field of environmental policy, where we have created a mammoth bureaucracy that has not delivered commensurate improvement in environmental quality . In this context, and in the interest of making the government more transparent and accountable, I would like my fellow citizens to ask of us how much it costs them to maintain this bureaucracy, and what they get in return. 111. For the first time, my budget poses this question to generate an open debate and discussion. In the ministries of environment and forest (m o ef), non-conventional energy sources (mnes), and water resources (m o wr), the cost per bureaucrat per year is a staggering Rs 1.21 lakh, 2.7 lakh, and 1.32 lakh, respectively(see table: The common person's burden ). In my own ministry, in the department of economic affairs, an official costs over Rs 1.9 lakh per annum. I believe the common man/woman of this country has a right to ask what they have received in return. Is the air/water cleaner? Do they have to walk less for water and firewood? 112. As you may have realised, what I am proposing is not only a rightsizing of government, but also greater accountability on the part of the government. From now on, we will hold government servants (including myself) responsible for delivering on their responsibilities in a time-bound manner. If, as finance minister, I cannot deliver sustainable economic growth, I do not have the right to be a minister. The same holds true for my esteemed colleagues, and for other officials. Please measure us not by what we say but by what we do. 113. Mr Speaker, sir, this is a budget truly devoted to sustainable economic development. It is a budget that is designed to make the government more transparent and accountable. 114. Mr Speaker, sir, with these words, I commend the budget to this august House." The author is Fulbright fellow at the Massachusetts Institute of Technology, usa , on leave from the Delhi School of Economics, University of Delhi.